If you are planning to remodel or refurbish your kitchen, having a well-planned layout can help maximise your space and make chores like cooking and cleaning easier to do. One of the things that you need to consider when renovating is where to put your appliances, specifically the oven. To help you out with this, we’ve listed some appliance configuration ideas you could try in your kitchen. If your kitchen space is limited, you can give up some unnecessary appliances and incorporate the things you need in an efficient way. Using a single wall oven can make the most out of the space you have by incorporating it into the kitchen cabinets or furniture. This arrangement is seen in most modern kitchens. Microwave and wall oven combinations make it easy to prepare multi-course meals. It also saves a bit of space whilst creating a cohesive and simple design. This setup offers the homeowner more flexibility when cooking. Also a familiar configuration, most manufacturers have versions of this appliance. Raised ovens, which are placed in a comfortable level, are also better for your back as you don’t have to bend down when using it. This arrangement is typically seen in modern and contemporary kitchens. It allows you to use both ovens at the same time, letting you check on them and compare their progress easily. This is also perfect for kitchens that don’t have enough room for tall cabinets. If you will be using your wall furniture for storage, you could install the oven in your kitchen island instead. It’s not a common setup but it’s a smart way to use your space effectively. 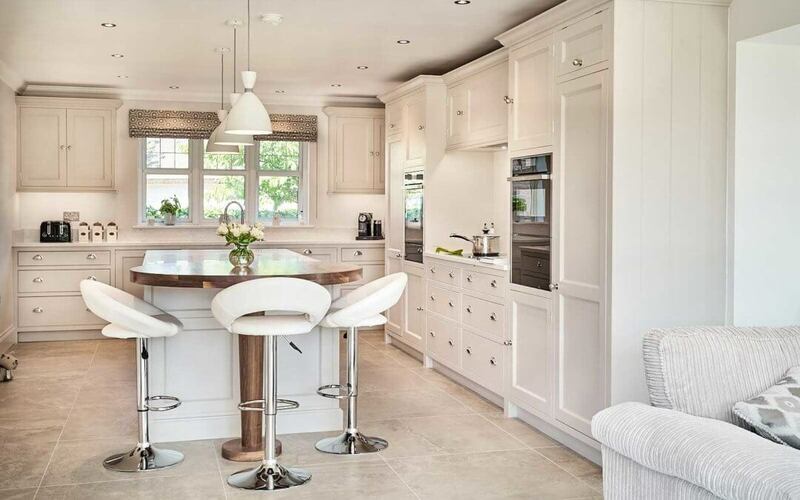 Hill Farm Furniture delivers bespoke, handmade, beautiful kitchens and furniture to suit your home and lifestyle. From initial consultation to completed project, we keep the customer at the forefront of our experienced and personal service. For enquiries, call us on 01636 626 063 or email us at enquiries@hillfarmfurniture.co.uk.